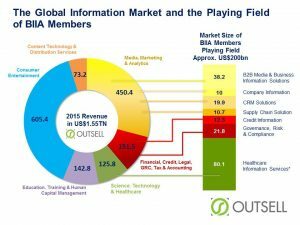 Outsell, Inc., the world’s only research and advisory firm focused on media, information, and technology, released its Media, Marketing and Analytics Market Sizing report. The Media, Marketing and Analytics market grew to $450.3 billion in 2015, representing 29% of the $1.5 trillion global information industry. The report shows that data-first companies that value first party over third party data, and mobile over traditional methods will grab investor attention in 2017. So too will martech platform players because they lie closer to customer data. The overall adtech market continues to grow through segment consolidation will increase driven by over investment. Marketing services was largely flat due to the currency impacts at agency holding companies. Martech and CRM solutions each grew 11% in 2015 driven by enterprise cloud players’ ability to successfully expand their customer bases. Despite major concerns about ad blocking and fraud, Adtech grew 15% in 2015. Marketing research fell 3.5% on currency impacts, while IT research rose 6%. The news industry shrunk 9% as publishers struggled with the increasing cost of news and the dominance of Facebook and other social platforms as breaking news providers. The report analyzes the forces and disruptive competitors that are driving the Media, Marketing and Analytics markets, and essential actions for organizations looking to compete as the market transforms. For more information about this report can be obtained from Srini Gomatam at[email protected], or call +1 650-342-6060. Joachim C Bartels of Intrepid Explorer, Inc. is an affiliate of Outsell Inc. and writes regularly about trends in the business and credit information market.